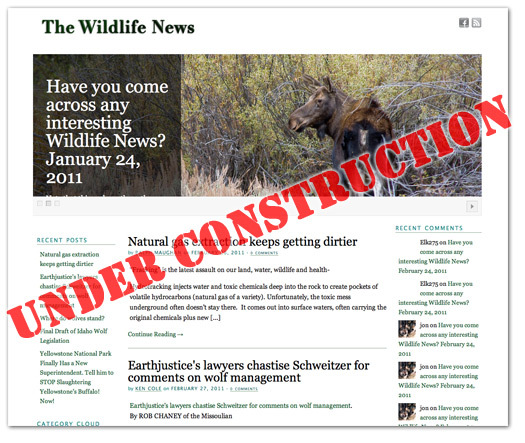 The Wildlife News is undergoing some changes. We’ve been migrating the site over to a ‘self-hosted’ webpage which we hope will better accommodate the rich conversation/debate about western public land and wildlife issues you’ve grown to expect over on our corner of the inter-tubes. By migrating the site from wordpress.com over to our own server we won’t need to pay to keep the site ad-free, we’ll be able to better illustrate many of the western wildlife issues of interest to you – as well as utilize many more ways for visitors to contribute. Thanks to The Wolf Recovery Foundation and Western Watersheds Project for their support of these much-needed changes ! Can’t wait to see the new digs after you’ve “moved” over! Hey Brian and Ken, you still doing that thing in Boise tonight?